While Laura Ingalls grows up on the prairie, Almanzo Wilder is living on a big farm in New York State. Here Almanzo and his brother and sisters help with the summer planting and fall harvest. In winter there is wood to be chopped and great slabs of ice to be cut from the river and stored. Time for fun comes when the jolly tin peddler visits, or best of all, when the fair comes to town. 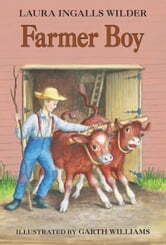 Almanzo wishes for just one thing—his very own horse—and he must prove that he is ready for such a big responsibility. 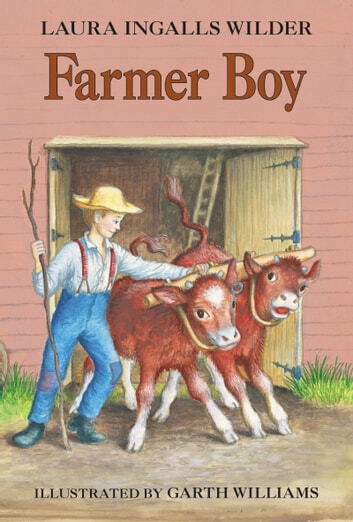 Farmer Boy is Laura Ingalls Wilder’s beloved story of how her husband, Almanzo, grew up as a farmer boy far from the little house where Laura lived. The nine Little House books have been cherished by generations of readers as both a unique glimpse into America’s frontier history and as heartwarming, unforgettable stories. Nice reading, you can actually put yourself in the story you can smell dinner cooking and the barns. You can feel the cold snow, and smell the dust and foliage. the story is very inspiring. the graphics are great too. good bed time story for kids. such an interesting story.